Our next guest is fellow C.O.B.R.A.S. agent, Peter Lorenz. Peter is a long time Bond collector specializing in James Bond artwork and books. He works as a Creative Director for a games company and lives in Cambridge, UK with his wife. 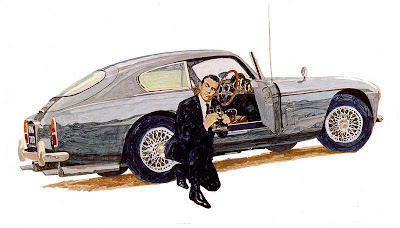 In his spare time he spends "way too much time and money" on his 007 collection, on painting reproductions of McGinnis and McCarthy artwork, and on his blog Illustrated 007. Many of us grew up reading and collecting spy fiction. At what age did you start to collect 007? I started when I was 10 years old. 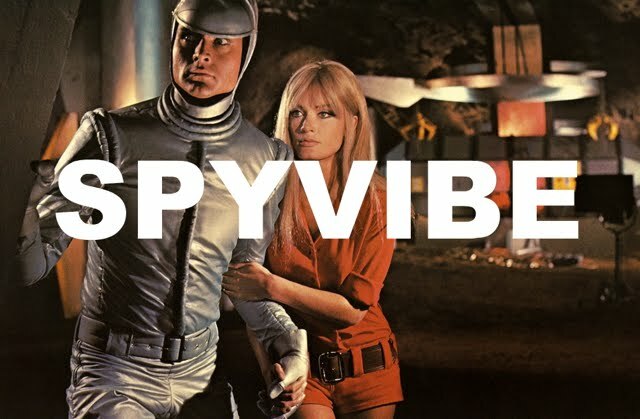 I had just seen The Spy Who Loved Me in the cinema and became fascinated with Bond. I was living in Germany at the time and looked for the original books, which were published by Scherz Publishers in the German language. The books featured mainly photo covers that were not related to the movies, but I still chased after them at flea markets and second hand bookshops. The budget of a 10-year old did not allow me to buy new ones. I've looked for all the Bond books I could get my hands on. 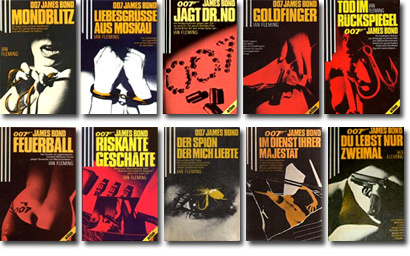 The German ones were OK, but I envied the covers of the British paperbacks, especially the painted ones. Back then there was no Internet or eBay, so I saved my money and flew over to London. The second hand bookshops in Charing Cross Road were a great source for used books, and so were the Oxfam Charity shops. I spent days going from one shop to another -all over London- and browsed through the shelves. Slowly my collection grew. The Raymond Hawkey Pan covers were the most common. 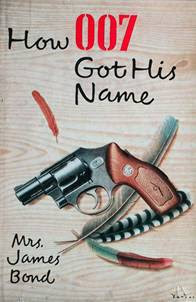 But sometimes I was lucky and got hold of earlier versions with covers by Sam Peffer or Rex Archer. Have you travelled to other countries besides England and Germany to find Bond material? My search for Bond memorabilia and artwork has taken me all over Europe and the US. Before the internet and eBay, the best chance of finding material was through other fans and traveling. I started with the UK, which had a much richer book and movie shop culture back then. Italy was next. The Bond movies were shown consistently in Italy and the posters, especially the insert-style locandia posters, were simply glued to external walls on buildings. I actually spent a whole evening with a spray bottle of water "removing" a reissued Goldfinger poster from a wall in Siena - hiding every time a car came around the corner. Paris was a good source for material as well. I have fond memories of a small movie shop near the Place de la Concorde that sold French and Belgian posters. I only wish that I'd had more money then. Spain, Belgium, Denmark and the US followed, and I always returned with one or more pieces for my collection. 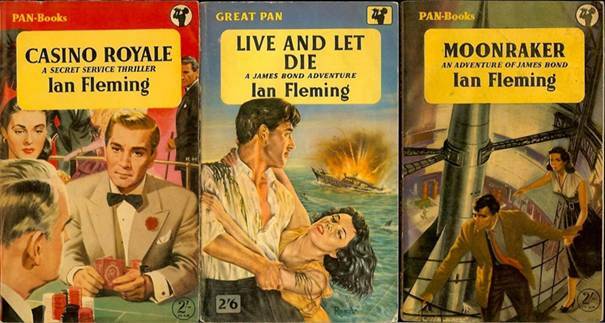 The early Pan paperback covers are my favourite, as they show interpretations of the Bond characters from different angles. 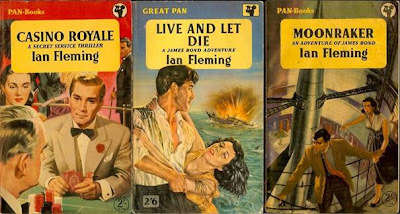 The first edition of Casino Royale shows a blond bond; Live and Let Die is more truthful to the character in the books. There are two books that I cherish: How 007 Got His Name -I found this in a small second-hand bookshop in Blackheath, London in 1992. I was so thrilled finding it because I've never seen it before and it was only 12 GBP then. The other one was a first edition, second impression of Casino Royale by Jonathan Cape. It came up in an auction at Bonham's. My wife and I went to the auction at Bonham's off Regent street in London around 2005. The book was estimated to fetch 250 GBP and I was getting quite nervous when the bidding reached GBP 280 -and still I went up with bidders in the room and on the phone. Luckily, I made it for GBP 300. This purchase also completed my (almost) first edition set on Ian Fleming Bond books. Fortunately or unfortunately, I've collected most of the published Bond books that I'm aware of - and that I like- so I’m now focusing on James Bond artwork, mostly reproductions. My blog, Illustrated 007, tells the rest. Here are some of my Bond books. 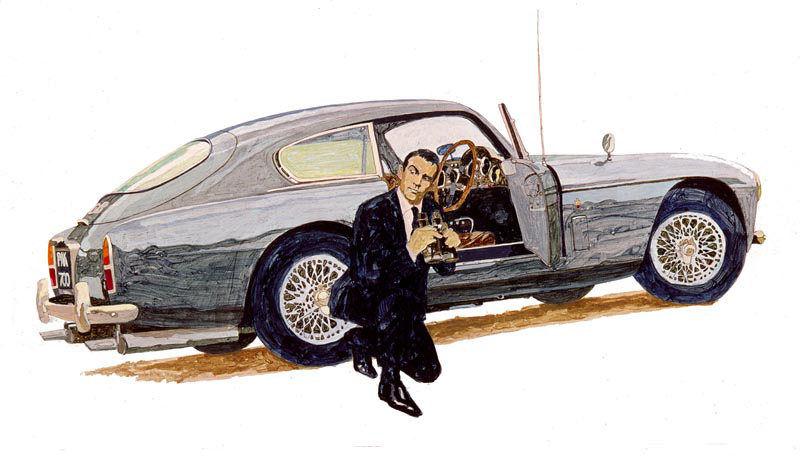 You have been painting some beautiful reproductions of many famous Bond illustrations. When did you get interested in studying Bond artwork so directly through painting? Thank you for the compliment! I guess there is a point in a collector’s life when one has all the posters one wants and begins looking for more. I have always admired the artwork of the early Bond posters and wanted to study the originals. This was also inspired by my long-time collector friend, Thomas Nixdorf, who has an amazing collection of originals. I realized quickly that most originals were out of my financial league, so I decided to paint copies for myself. Initially I thought this wouldn't be too hard for me as a trained designer who studied art - I just had to copy what was there. I was very wrong. My first piece was the standing Connery from Thunderball and it looked plain awful - but I didn't give up. I must have painted the same piece about 20 times before I got it right(ish). The whole process taught me a lot about how the likes of McGinnis and McCarthy worked: The use of the brush, layering, colour combinations, etc. It's fascinating to study details of an original that are lost in the reproduction. 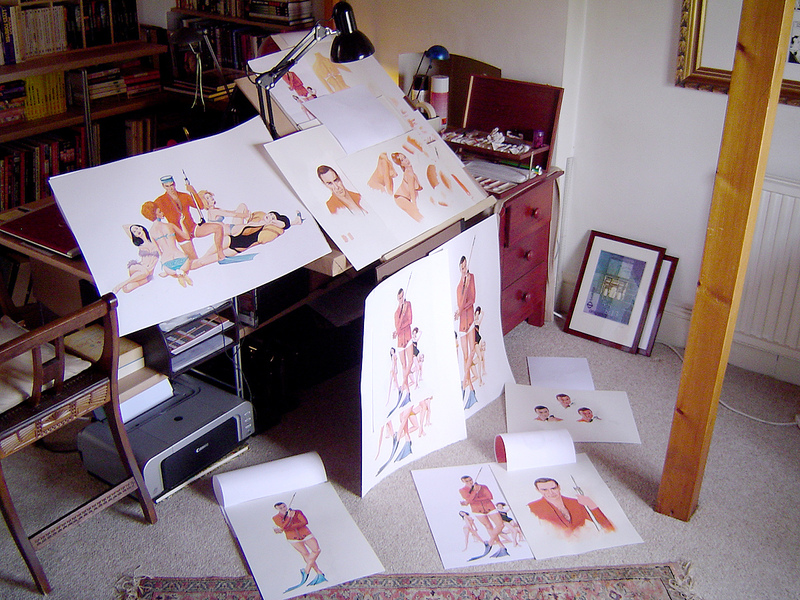 Have you been able to correspond with any of the Bond illustrators to learn about their approach and career history? I've had the pleasure of corresponding with several Bond artists such as McGinnis, Obrero and Jung. They are all very friendly and helpful. An especially nice encounter was with Brian Sanders who painted the artwork below. I found an illustration of his in the blog, todaysinspiration.blogspot.co.uk, and contacted Brian. Turned out that he lives 10 miles from me, and we now meet regularly for dinner. 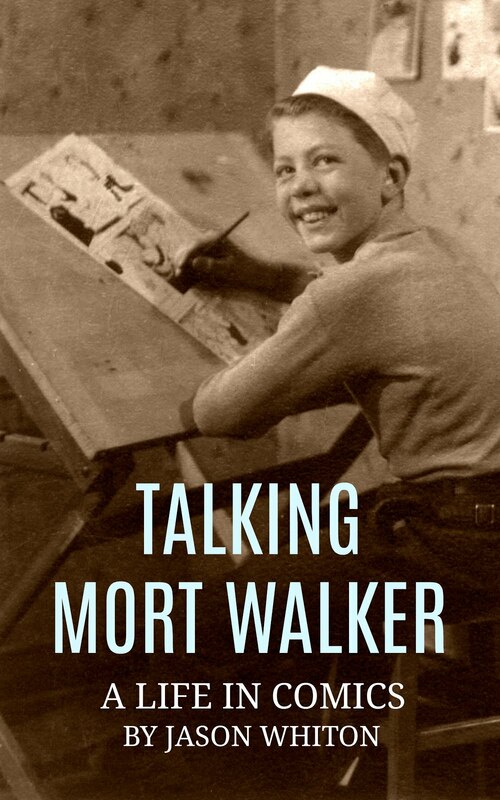 It is fascinating to learn from him how the world of illustration worked in the 60's and how it has changed since then. Tell us more about the art that attracts you. Do you look for specifics re: artist, medium, story, publication, era, or just any production art in general? I've always been keen on pulp-style art - men with guns, action, beautiful women and exotic locations all rolled into one piece of art. Consequently I focus on illustrated and painted artwork mainly from the 50' and 60'. I simply love the variety of art created for one movie depending on country and artist. I'm also very fond of early newspaper comic strip illustrations, such as the work of John McLusky. He translated the written Bond into a clean and elegant style that is very much Bond for me. Do you display the art in your lair? Some of it. English houses tend to be modest in size so I can't display as much as I like. For my work area I decided to focus on the Thunderball campaign. The paintings in the window [below] are usually in a display folder. I think we all picture Bond in our heads when we read Ian Fleming. 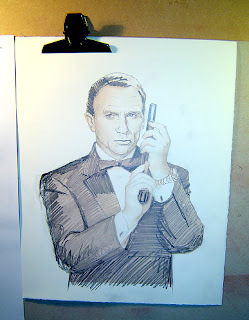 Have you ever painted your own version of how Bond looks to you? Not yet, but it's in the pipeline. I intend to base it on Charles Dance, who portrayed Ian Fleming in the TV biopic Goldeneye. 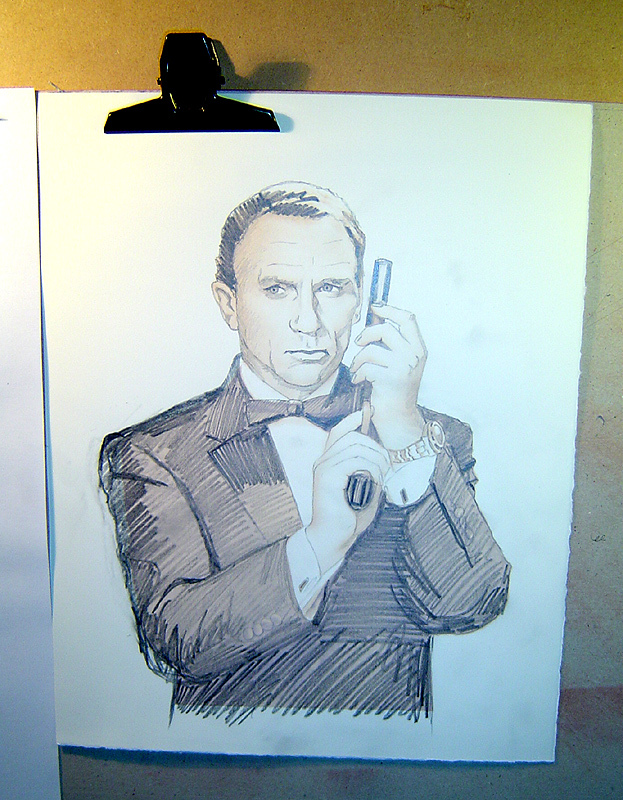 However I'm working on a painted version of Craig for Skyfall right now. Photographic posters are fine but I dearly miss the painted style of the old films. Let's see how this one turns out. It's still a work in progress. Thanks again to Peter for joining us and sharing his love of collecting and reproducing James Bond art. 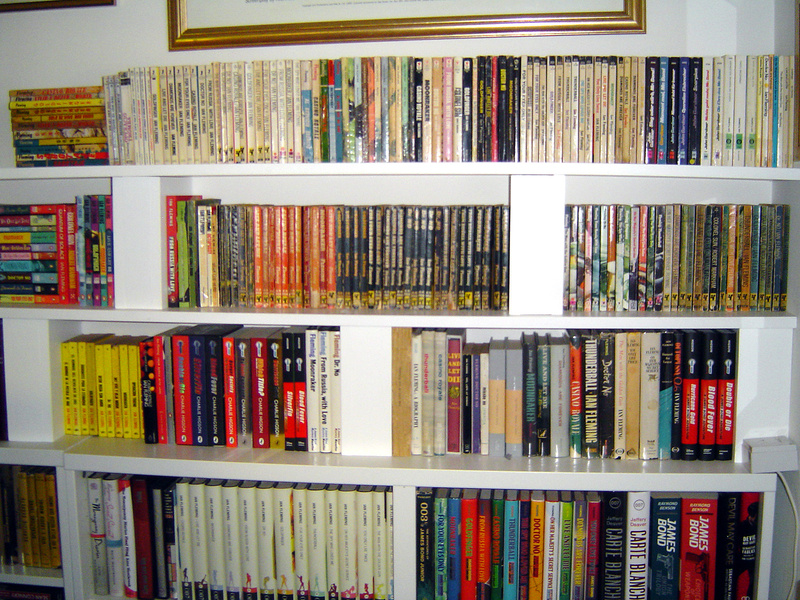 Scroll down for past editions of our series, For Your Shelf Only, where guests share stories about collecting and show us some of their treasures. Series links: Jon Gilbert, Raymond Benson, Jeremy Duns, Peter Lorenz, David Foster, Rob Mallows, Roger Langley, Craig Arthur, Fleming Short, Matt Sherman. 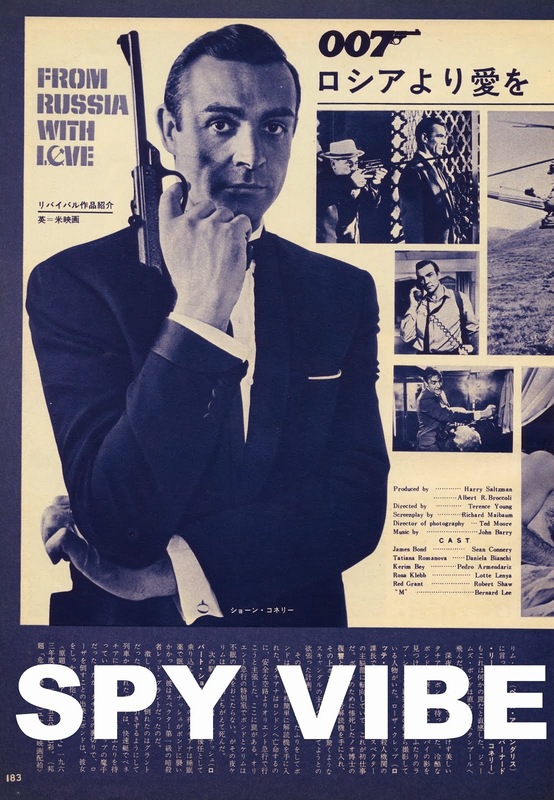 You can find cold war design books and other spy treasures in Spy Vibe's secure Amazon Store. Is it just me, or is that Richard Conte on the Pan paperback Casino Royale?